Tom McNish was born in 1942 in Madison, Tennessee. He attended North Carolina State University for one year before entering the U.S. Air Force Academy in 1960. McNish graduated and was commissioned a 2d Lt on June 3, 1964, and completed Undergraduate Pilot Training and was awarded his pilot wings in September 1965 at Williams AFB, Arizona. He next completed F-105 Thunderchief combat crew training before being assigned to the 354th Tactical Fighter Squadron at Takhli Royal Thai AFB, Thailand, in June 1966. Lt McNish was shot down over North Vietnam and was taken as a Prisoner of War on September 4, 1966, while flying his 45th combat mission in Southeast Asia. After spending 2,373 days in captivity, he was released during Operation Homecoming on March 4, 1973. He was briefly hospitalized to recover from his injuries at Maxwell AFB, Alabama, before beginning his pre-medicine classes at Emory University. Capt McNish graduated from Emory University School of Medicine in June 1978, and interned in the Department of Family Practice at the University of Texas Heath Science Center in San Antonio, Texas. He completed family practice residency in 1981 and then began a residency in Aerospace Medicine at Brooks AFB, Texas, where he graduated in June 1983. During this time he was selected for the USAF Pilot-Physician program. Dr. McNish served as Chief of Aeromedical Services and Commander of the Air Transportable Hospital at Myrtle Beach AFB, South Carolina, from December 1983 to May 1985, and then as Commander of the USAF Hospital at Myrtle Beach, where he served until July 1986. During this time, he maintained mission-ready qualification in the A-10 Thunderbolt II, flying with the 354th Tactical Fighter Wing, and was designated by Tactical Air Command as the weapons system flight surgeon for the A-10. Col McNish next served as Commander of the 833rd Medical Group and the 833rd Tactical Hospital at Holloman AFB, New Mexico, from July 1986 to October 1988. He flew the AT-38 Talon with the 479th Tactical Training Wing while at Holloman. He was then assigned as Chief of Flight Medicine in the Office of the Air Force Surgeon General until June 1991, when he became the Command Surgeon in the Office of the Air Force Reserve at the Pentagon, where he served until his retirement from the Air Force on July 1, 1994. Dr. McNish is married to the former Yona Gross of Montgomery, Alabama, and they have three children-Lori, Amy, and Tommy; and five grandchildren. 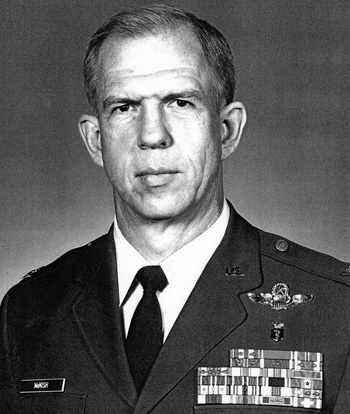 First Lieutenant Thomas M. McNish distinguished himself by gallantry in connection with military operations against opposing armed forces near Hanoi, North Vietnam, on 4 September 1966. On that date, as pilot of an F-105D Thunderchief, Lieutenant McNish was directed to destroy a large Petroleum Storage Facility used in support of the North Vietnamese aggressive policies. In the face of savage defensive artillery and missiles, Lieutenant McNish continued to press the attack and successfully delivered his weapons to destroy the assigned target. 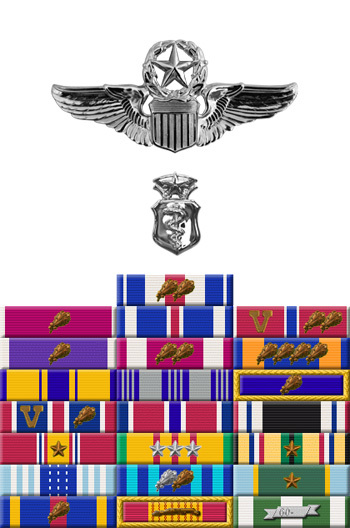 By his gallantry and devotion to duty, Lieutenant McNish has reflected great credit upon himself and the United States Air Force.